We now have Shipping Centers in London, Paris and Toronto, we can support our customers with packing/crating and shipping services in Canada and Europe, as well as we do our domestic customers all over the United States with our Miami/Ft. Lauderdale, Chicago, Houston and New York Tristate Centers( NY/CT/NJ) Locations. Do you have packages, a consignment or orders that need to go overseas? Shipping freight or large items can be a painful learning experience for those unfamiliar with international shipping. Customs duties and paperwork, international shipping regulations and finding the right carrier can make international shipments difficult and time-consuming and expensive. The best solution is an experienced freight forwarder. A freight forwarder is an 'Architect of Transport', handling the logistics of overseas shipping. That's what we do. Let Boxbrosla.com take care of it, and know that your shipment will arrive safely, on time with no hang-ups. We've been in the Freight Forwarding business for over 19 years and have the knowledge and experience to get it delivered quickly and at a fair price. Whether you are shipping to New York City, Asia, Africa, Australia, Europe or shipping to South America. Give us a call toll free at 855 BOX BROS (269 2767), or get an online quote today. 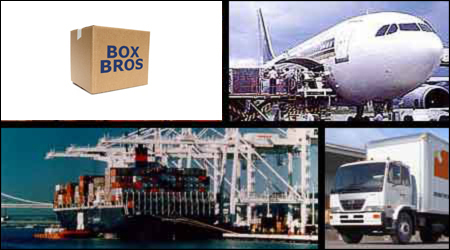 Box Brothers handles the freight forwarding from door to door or we can arrange for pickup at the terminal closest to you or your customer. We have a network of agents and affiliates in Atlanta, Boston, Chicago, Dallas, Los Angeles, New York, San Francisco, Seattle, and in major cities across 5 continents ready to meet all your shipping requirements. We have the expertise to prepare and process the documentation and do everything pertaining to all forms of shipments, including air, ocean or Fedex Express international shipments. We handle pickup at your location, packing, crating, the commercial invoice, shipper's export declaration, bill of lading and other documents required by the carrier or country of export, import, or transshipment and allow you to do what you do best while we get your shipment delivered quickly, safely, with no snags or "gotchas" at an affordable rate! Call Now toll free at 855 BOX BROS (269 2767), or get an online quote today.